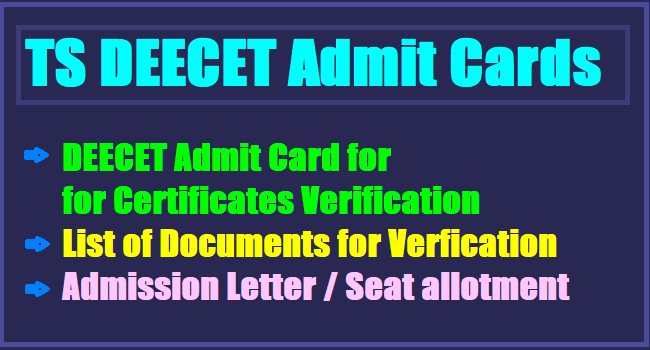 TS DEECET Admit Cards for Certificates Verification/ Seat Allotment Provisional Admission Letter for TS DEECET 2019 for Certificates Verification-D.Ed Course #Fee Payment: Download Admit Card/Provisional Admission Letter(PAL) for TS DEECET First, Second, Third Phase Counseling Certificate verification 2019 for Admission into 2 year D.Ed courses for 2019-2020 batch. TS DEECET 2019 Officials time to time release the Provisional Allotment Letters after completion of selection of web based college selection and also they will provide the college wise provisional allotment list. 1. Third Phase Counselling for Certificate verification from 25.10.2019 to 27.10.2019. 2. D.P.S.E(Diploma in Primary School Education) counselling From 25.10.2019 to 27.10.2019. 3. Third Phase Web Options for D.EI.Ed., From 25.10.2019 to 27.10.2019. "Allotment of D.Ed Seats to D.El.D colleges are available in the TS DEECET Website from ...07.2019 onwards." The DEECET 2019 qualified candidates, who were going to certificates verification they should attend the certificates verification at you concerned districts Govt DIETs with your TS DEECET Admit card along with required documents. After verification process, they should give the web options in the Phase I/II/III web based counseling stream, After they can download your Provisional Allotment Letter(Seat allotment Letter) from TS DEECET Website and check your name in your college list. They should the allotted colleges along with required documents. Telangana State Diploma in Elementary Education Common entrance Test (TSDEECET - 2019) merit list and results have been declared on the official website of TSDEECET 2019. The TSDEECET 2019 results are available on Tsdeecet.cgg.gov.in. TSDEECET 2019 is conducted by Department of School Education, Government of Telangana for candidates who intend to take admission into two years Diploma in Elementary Education (D.EL.Ed) in Government District Institutes of Education & Training (DIETs) and Private Elementary Teacher Training Institutions in the state. The candidates are advised to check the TS DEECET 2019 website for further details about counselling. "The Ranks assigned in this Merit List are only tentative as they are based on the data submitted online by the candidates and hence are subject to change as per the 'Physical Verification of Certificates' to be caused shortly," said the results notification. Here we are provided model Provisional Allotment Letter for Phase I/II/ III Certificate Verification. Candidates should prepare the required list of documents to be produced at the time of verification of certificates and Check in you are allotted particular college. When the Phase I Web counselling and allotment of seats process to be started soon in this month. After completion of I Phase, the II Phase web options process will be started. So, DEECET Candidates should follow the below instructions for downloading the PAL. 1. First Click the below given link. 2. See the Download button and then Click on Download button. 3. Enter your Hall Ticket Number. 4. Enter your Date of Birth. 5. Then Click on GO button. This time DEECET officials Team has provided a facility to download the Colleges wise Provisional Allotment list of Particular District. So, Candidates can also download the particular college allotted candidates list from the DEECET Website. in the category of-------------------based on the State Rank of ................... secured by her/him in TS DEECET 2019. She/he is requested to attend the session for verification of certificates and payment of fee prescribed at the District Institute of Education and Training, District Name............................(Your allotted College Govt.DIET) on ----/-/2019 at 10:00 AM along with the documents shown below for issue of Final Admission Letter. Issue of Final Admission Letter is subject to the Terms and Conditions mentioned below. Note: Provisional Admission Letter Downloaded Candidates should(compulsory) attend the Certificates Verification and Pay Tuition Fee at Govt DIET(Place date mentioned in your Letter) only and Candidate should read and follow the important instructions given in the Provisional Admission Letter for attending the certificate verification. Pdf of ONLINE application of DEECET 2019. Rank Card of DEECET 2019. SSC or its Equivalent Certificate for proof of Date of Birth. Certificates of Qualifying examination (Intermediate or equivalent) as submitted in the ONLINE application. Transfer Certificate from the institution where last studied. Integrated Community certificate issued by MRO for candidates claiming admission under quota For reservation of BC / SC / ST categories. PH Certificate issued by the District Medical Board in case of candidates claiming reservation under quota for PH category. Income certificate issued by Tahsildhar after 01.01.2019 of parent/s of SC & ST candidates whose income is less than Rs.2,00,000 per annum from all sources and Rs.1,00,000 in respect of BC candidates claiming exemption of Tuition fee (Rs.2385.00 in case of Colleges under Government Management and Tuition fee Rs.11000.00 in case of Colleges under Private Management for One year). The students belong to SC/ST/BC/ PHC will be considered for Reimbursement of Tuition Fee (RTF)/ Financial Assistance under (FAST) is subject to verification and eligibility criteria prescribed by the respective State Governments of Andhra Pradesh and Telangana. Tentative fee payable now is subject to fulfilment of eligibility criteria. In case found not eligible, the candidates shall pay the difference of fee. As per Memo.No.286/EC.A2/2014 Higher Education Department, Government of Andhra Pradesh dated 24-08-2014, All the students who are local as per Presidential order in the state of Andhra Pradesh, whether they are studying in the institutions in Andhra Pradesh or Telangana State shall be given fee reimbursement from the Government of Andhra Pradesh as per eligibility criteria of fee reimbursement scheme of Government of Andhra Pradesh. As per the approved note of Higher Education Department of Government of Telangana dated 12-08-2014, students may be eligible for financial assistance to the students of Telangana (Under FAST Scheme) vide G.O.Rt.36, SCD Department dated 30th July 2014, subject to eligibility as per the detailed guidelines to be issued by the Government of Telangana Shortly. In case of candidates with local area=NL, the eligibility for RTF/FAST will be decided by the State Government. 1. Should Attend Certificates Verification: Candidate should without fail attend to the session for verification of certificates on the above shown dates. Otherwise this Provisional Admission letter stands cancelled and the vacancies that arise in such cases will be considered for candidates who follow them in the merit list during the second phase of web based selection of colleges for admission. Any request for consideration of admission after being absent for the session for verification of certificates during the prescribed time will not be entertained. 2. Produce the relevant documents: Issue of this Provisional admission letter is based on the particulars of candidate submitted by them in their ONLINE application and on the State Rank secured by her / him. Hence, if the candidate fails to produce any of the relevant documents (as listed in the Provisional admission letter) in support of the claim for admission her / his admission stands cancelled. 3. Should pay the prescribed fee for issue of Final Admission letter: Candidates should pay the prescribed fee at any of the TS ONLINE Center for issue of Final Admission letter with which the candidate can proceed to the college into which she / he is given admission. Fee once paid will not be remitted back even if the candidate withdraws admission. 4. Maintain strict discipline during certificates verification: Candidates shall maintain strict discipline during the session for verification of certificates. Any candidate who obstructs the session or misbehaves or causes disturbance as to whatsoever will be subject to disciplinary action as per rules. #5. First phase admitted candidates can participate in II Phase Web Options process: If any candidate who is given admission during the first phase of web based selection of colleges wants to shift to any other college based on the vacancy list after first phase they can apply for the same during the second phase of web based selection of colleges. మీకు మీ సిబ్బందికి దసరా శుభాకాంక్షలు . namasthe sir naku ts dee cet lo 46 makes vachayi, maa cast st.
naku TTC lo seat vasthey naku fee reeambersment vasthadha Sir oka vela rakapothey ravalante em cheyyali sir? Meeru D.Ed Course ki Amaina TUition Fee Kattinatlaithe(Private D.Ed Collegelo)..meeku Fee Reimburse untundi..
Sir naa rank 7775 rangareddy district, oc Naaku seat vastunda sir please Cheppandi. sir please give the suggetion. Officials are not given any announcement on this regarding.. So, Third Phase anedi seats migulithe conduct chesthaaru..
Seats migilina information vachchina Tharvathane emaina cheppagalanu..